Blog Quick Quotes: Mini Album Inspiration with Want2Scrap by Dana! Mini Album Inspiration with Want2Scrap by Dana! Hi Quick Quotes fans! Dana here today sharing a wedding mini album I created using the NEW Quick Quotes Sheer Joy collection and Want2Scrap chipboard and bling. I used the Want2Scrap Gates of Love Chipboard Album. I embossed the ornate chipboard album cover with chunky gold embossing powder for a fantastic sparkle. I then layered Petaloo flowers, a Want2Scrap Silver Rhinestone Frilly Flourish Swirl, which I cut into several pieces and tucked around the blooms, and a Quick Quotes Sheer Joy Chipboard Die Cut onto the cover. Rather than have this album open horizontally like a book, I thought it would be fun to design this album to open vertically. Here is a look at the inside pages. I covered the chipboard pages of this album with Quick Quotes patterned paper from the Sheer Joy and Calypso collections. The Quick Quotes stickers, die cuts and vellum, and the Want2Scrap chipboard words and rhinestones were the perfect embellishments to help make these wedding photos come alive. The sheet of Sheer Joy Chipboard Die Cuts offers a fantastic variety of chipboard in several shapes and sizes. The larger pieces are designed beautifully, with multiple fonts and colors. The smaller pieces are perfect for accenting wallet sized photos. I colored the Want2Scrap Love Fancy Chipboard Word with Vintage Photo Distress Stain. I colored the Want2Scrap Joy Fancy Chipboard Word first with white acrylic paint and then a coat of peach embossing powder. I inked the edges of the album pages with Creamy Cocoa or Coral PowderPuff Chalking Ink. I also used those shades of ink to embellish the patterned papers with subtle music and script stamping. 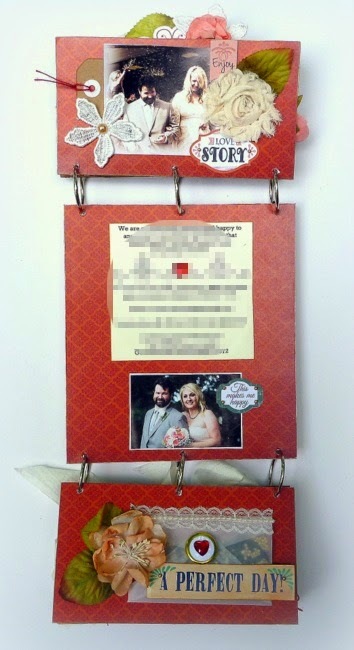 I tucked several tags behind the photos so that the bride can add her own journaling. I absolutely love the Want2Scrap Pink and Red Rhinestone Bling Hearts! I had to hold myself back from using them on every page. The Want2Scrap 72-Count Self-Adhesive Pearls and Rhinestones include 3 different sizes of bling on each sheet and are perfect for embellishing chipboard words, chipboard die cuts and photos. The small 3mm pearls and rhinestones are a great way to add subtle sparkle to any project. I can always find the perfect saying in the Sentiments and Family Quotes Bundles. The vellum quotes add a fantastic softness to the album pages. I am gifting this album to the happy couple so I added the This Book Was Lovingly and Thoughtfully Vellum to the back of the album. The text on this vellum is heartfelt and helps to convey the love and joy I felt on their special day. Thanks for stopping by today! I hope I have inspired you! Dana this is absolutely stunning in every way! They are going to treasure this forever. What a wonderful gift!!! What an amazing album! So many perfect details. Just gorgeous!